With their two bulky boxes and separate line-stage, these Lavardin amps fit right into this group 2, visually if nothing else. 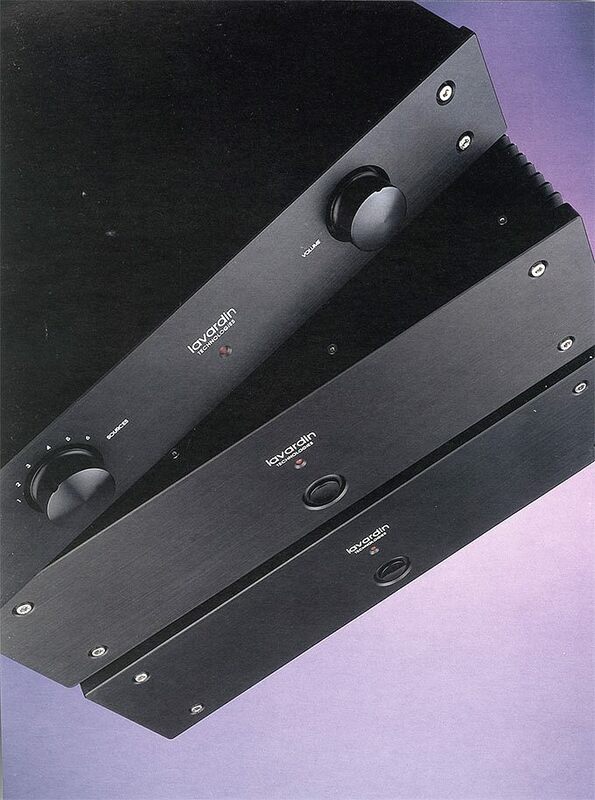 But look a little closer and you'll find that despite their generous dimensions their rated output tips the scales at a mere 60 watts per channel. Not valve watts or class A watts, imaginary articles of faith so beloved of the acolytes of those particular technologies (as if units of power are derived on a sliding scale dependant on where the power comes from). A watt is a watt, and whilst there are different ways to measure them, the unit remains the same, and the Lavardin mono-blocks offer 60 of them. Which isn't exactly high-power, so what are they doing here? When I reviewed the Lavardin IT integrated amplifier in Issue 2, it offered an astonishing level of performance at the price. Its only significant sonic shortcomings were a slight lack of top-end air, and, when asked to drive awkward loads, a reduction in the maximum level available. Of course, the IT is a cut down racing snake of an amplifier, with nothing as superfluous as a tape output, and operational facilities limited to source select and a volume control. With only four inputs it's aimed fair and square at the hair-shirt audiophile for whom sound quality is everything. And it succeeds handsomely. But Lavardin are aware of both the IT's minor limitations, and the fact that there are plenty of people out there with awkward loudspeakers and the requirement for rather more than four inputs. Which brings us to the PE/MAP combination. The MAP mono-blocks are simply single channel versions of the IT, with the entire power supply given over to just one output stage. Hence the identical power-rating to the IT And whilst this isn't exactly a new approach to the problem of extracting if not more juice, then a more concentrated pressing from a low powered design (the Naim NAP135 was the first example I came across), it certainly offers a possible alternative to conventional high-powered approaches. Hence its inclusion here. Both the line-stage and mono-blocks employ circuitry designed to minimise memory distortion and provide a stable working temperature for their solid-state devices. 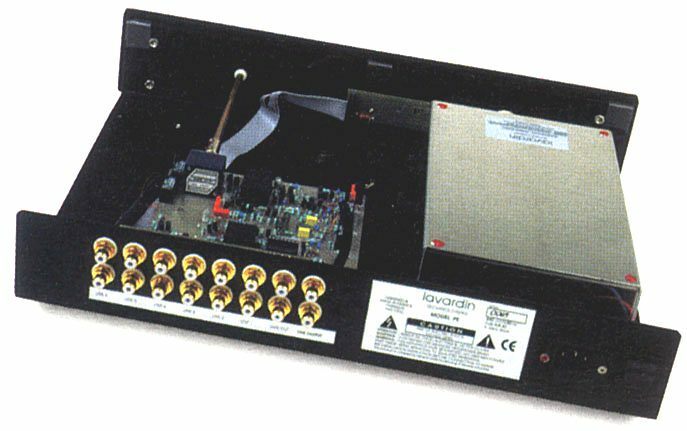 As recounted in the interview accompanying the IT review, Lavardin have been engaged in a long term research project which has identified these as key factors in amplifier performance, and whilst thermal variation has long been recognised, memory distortion (the signal leaving a trace or echo in the devices it passes through) is an entirely new concept. I can't comment on the theoretical validity of their work, but their products sound notably clean and uncluttered, so the sonic evidence seems to support it. The PE line-stage may be slightly less hair-shirt than the IT, but its outlook is still pretty Trappist. Offering six line inputs and single tape and main outputs, the facilities are adequate, but no more. There's no remote control, balance control or balanced circuitry, nothing but the basics. Having said that, the source switching is relay protected, the new input taking about 3 seconds to engage, indicated by the dimming and brightening of the red power LED. Input six seems to be routed directly to the board, offering the shortest signal path. The MAP mono-blocks are as simple as can be. 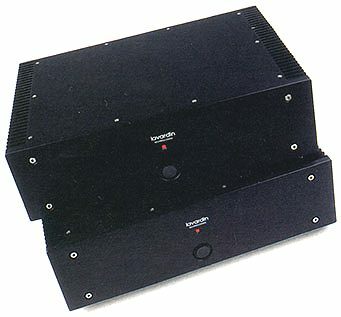 One phono input and a single set of five-way binding posts. Switch on is relay protected and that's about it, apart from pointing out that only one heat sink gets hot! And if the units themselves are simplicity personified, so is set-up, as long as you follow a few simple rules. All Lavardin electronics prefer a wooden support, glass is definitely to be avoided. I used the Clearlight Audio rack, which is ideal in terms of both size and materials. Use the supplied power cords, plugged directly into the wall, and pay attention to mains polarity (the hot pin on the IEC input is indicated with a red blob). Lavardin also produce their own cables (short interconnects and speaker cables at around 3.5m only). The speaker cables in particular are expensive, and only being available in one length will either fit or not, but the interconnects are more affordable and work better with the Lavardin electronics than anything else I've tried, regardless of price. Despite their plain Jane appearance they should be considered as essential elements of a Lavardin system. You'll also find that the 4mm sockets in the binding posts are blocked. This has nothing to do with EEC regulations, but merely reflects Lavardin's belief that the speaker connections should be made at right-angles to the post. Not surprisingly given the single set of posts, they also recommend single wiring. Experiment has shown that, as far as their own equipment goes, their recommendations are spot-on, so ignore them at your peril. Along with the line-stage and mono-blocks, the PO phono-stage made a welcome reappearance, so with the Clearlight Recovery/Incognito Rega at one end and the NHT 2.9s at the other, I had a complete Lavardin electronics package. CD players were the Rega Jupiter/lo and Wadia 860x, the latter feeding the mono-blocks directly from its variable analogue output. Not surprisingly the line-stage and mono-blocks sound almost indistinguishable from the IT when driving an easy load. They're not just cut from the same cloth, you can even match the patterns, especially across the broad mid-band where the PE / MAP combination retains all the considerable strengths of the IT. 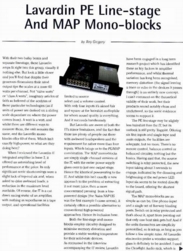 You could do worse than re-read the IT review in Issue 2; its description of what the Lavardin electronics do, and how they do it applies equally to the more expensive models. But for those of you who don't have Issue 2 (or don't have it to hand) here's a (very) brief precis. 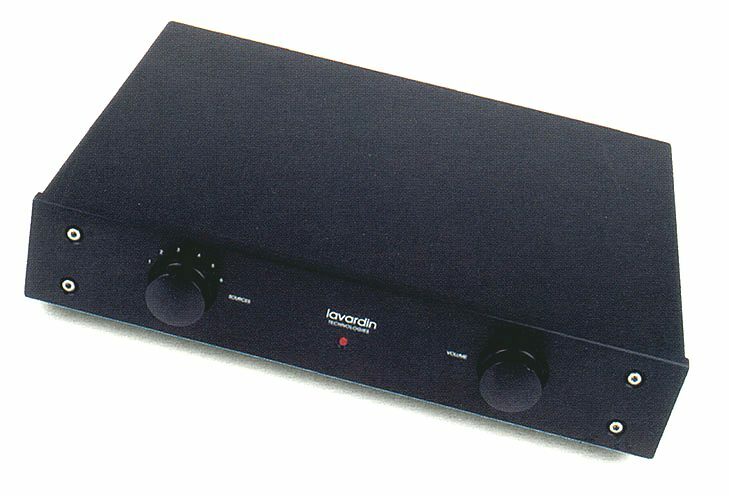 Comparisons with a Lavardin amplifier make just about everything else sound cluttered and clumsy. The French amps sound clear and clean, but they manage not to sound clinical or sat-on. I described this in terms of transparency, but not just in the conventional hi-fi sense, although that certainly applies. 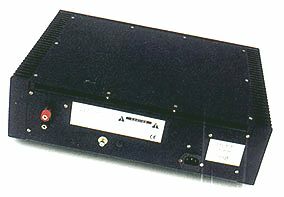 The effect of the amplifiers' presentation is to allow you to see into the recording as a representation of a real event. In other words it gives you access to the nature of the recording itself, the elements that make up the music and their precise arrangement, the pattern of the music as a whole. They do this by not obscuring the micro dynamic shifts in level around and within notes, or their precise position in time, bringing the playing of individuals and the chemistry of a group alive. But the really neat trick is the way that the Lavardins' offer insight into the minutiae of a recording without pulling it apart or distracting from your enjoyment of the whole. They'll extract full musical value from even the worst recordings, and what's is more, because of their outstanding musical and dynamic coherence, they are capable of remaining convincing even at low levels. So consistent is this performance that listening side by side through the Audioplan Kontrasts you'd be hard pressed to tell the PE/MAP combination from the IT. In fact, if you get the set-up and cabling on the more expensive system wrong, then the IT shades in front because of the greater simplicity of its internal line stage. Why bother with the separates at all, you might well ask. Because they are designed to overcome the IT's shortcomings, or more specifically, to offer greater potential with awkward loads. Wheel in the NHTs and the picture changes. Unlike most amplifiers of moderate power presented with an awkward load, the IT doesn't collapse at the frequency extremes. You get the full range, it just won't go as loud. This is less of a problem than it might be, given the amplifier's astonishing coherence at low levels, but there's no denying the occasional requirement for some serious wallop. That's exactly what the PE/MAP set-up provides - more headroom. Long and loud sessions with the likes of Guitar Town, London Calling, Moloko and Thea Gilmore all confirmed the unflappable and un-burstable performance of the mono-blocks. Okay, so I wouldn't recommend them for Apogee Scintillas, but they are a serious improvement over the IT in this respect, making short work of the power hungry B&W Nautilus 801's, a speaker that just has to be played loud. But the benefits are not just limited to more volume and a couple of extra inputs. Along with the head-room you get a touch more authority in the bass, and even greater stability to the soundstage. This was especially obvious with the Wadia, which driving the MOs direct from its analogue outputs represents a marriage made in heaven for digital only audiophiles. The 860x simply exudes seemingly bottomless bass dynamics which the Lavardins' managed both to track and prevent becoming earthbound. Acoustic bass floats correctly synthetic bass arrives in slabs - just how it should be. At the other end of the spectrum, the PE and MAP mono-blocks actually restore the air that's missing from the IT, bringing more readily defined space to the recorded acoustic. What does all this mean in musical terms? Listening to the fascinating Das Mikrofon album from Tacet in Germany, a record which allows you to compare and contrast the performance of some 25 vintage microphones, the character and performance of the different transducers is immediately apparent. The space and life of the RCA 77 DXs expansive soundstage contrasts with the slightly pinched and ascetic sound of the Neuman U67. The presence, weight and warmth of the U47 is instantly familiar from so many `golden age' stereo recordings. And whilst these explicit differences aren't exactly surprising, the intelligibility of them, the ease with which the Lavardins let you identify them most certainly is. Now whilst listening to the same short piece on ten different mics isn't exactly normal listening behaviour, the conclusions hold good for all kinds of music. The Lavardins offer immediate and direct access to the recorded performance - or in other words, you get to understand what's going on much more readily. Re-reading the final paragraph of the IT review I find it still sums up my feelings perfectly, so here it is again. The bottom line here is that the Lavardin electronics produce more music, more coherently and consistently than any other amplifiers I've had at home. They also represent the first serious challenge to the Jadis in something like ten years. They are effortlessly un-fussy, and if anything, sound rather understated. If you want spectacle and fireworks, or a comfort zone, look elsewhere. But if you value the natural presentation of the widest possible range of music, they should be top of your list. I'm in no position to assess the accuracy, or otherwise, of the technical claims made by Lavardin, but they certainly seem totally consistent with the way the amps sound, making a sort of intuitive sense. They really do let you have your cake and eat it. In the year or so since I first met the IT integrated amp, it, and now the PO phono stage, have become both essential tools and a source of constant pleasure. Do I like them? Could I live with them? Do I covet them? Yes, yes and absolutely! With a wider operating envelope and even fewer deficiencies the PE line-stage and MAP mono-blocks offer Lavardin's exceptionally satisfying musical performance to a broader audience. As a reviewer, their versatility makes them even more attractive than their smaller brother. Despite the elevated price level they still represent excellent sonic value, which only goes to underline what an outstanding bargain you're getting with the IT.